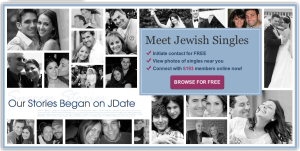 JDate has become one of the most well-known and popular online dating sites for the Jewish community. Like many religions, a lot of Jews prefer to marry or date within their faith, which makes JDate an even more successful dating site. JDate prides itself on strengthening the Jewish community, and is a great place to meet fellow singles! While it’s not limited to Jewish dating, the majority of it’s members are of Jewish faith. JDate has a high rate of success stories, which have been featured in mainstream publications like The New York Times, People, and ABC News. JDate promotes Jewish dating, but also finding love, romance, and meeting the potential man or woman of your dreams. Like some online dating sites, JDate’s “You Click” features lets you answer YES, NO, or MAYBE to whether or not you think you’d be interested in someone or not. They won’t know what you’ve clicked unless you have a mutual YES, and then the real flirting happens! JDate offers a JMag and JBlog for Jdaters to read about various articles, blog posts, and JDate success stories. Once you’ve created your profile, sent out your flirts, and JDated the day away, it’s nice to sit back and read about what’s going on at JDate. These days, an online dating site is nothing without a mobile app. 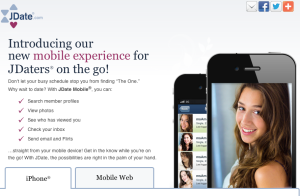 JDate’s mobile lets its users search through other user profiles, view photos, check your inbox, and send out emails and flirts. Dating on the go has never been this fun! JDate is a little on the expensive side, but because it specializes in setting up same faith couples, it’s worth the time and money! JDate has been said to have scammers create fake accounts-but hey, what online dating site doesn’t? You must use your discretion. Once you sign up for JDate, you are able to send out FLIRTS, use the YOUR CLICK feature, and review your matches by email. For everything else, you must sign up for the standard or premium membership. JDate is a highly acclaimed online dating site that is known for its high success rates. It’s been around since 1997, and is only continuing to grow. Jews from around the world use JDate, because its a perfect hub for finding the man or woman of your dreams, especially within the small Jewish community. While JDate is open to anyone, the majority of it’s members are Jewish, making it easy to find single Jews online. We loved the features at JDate, and think that you will too! Jewish dating has never been this fun! Find love and romance with fellow Jewish daters, and become a JDater.